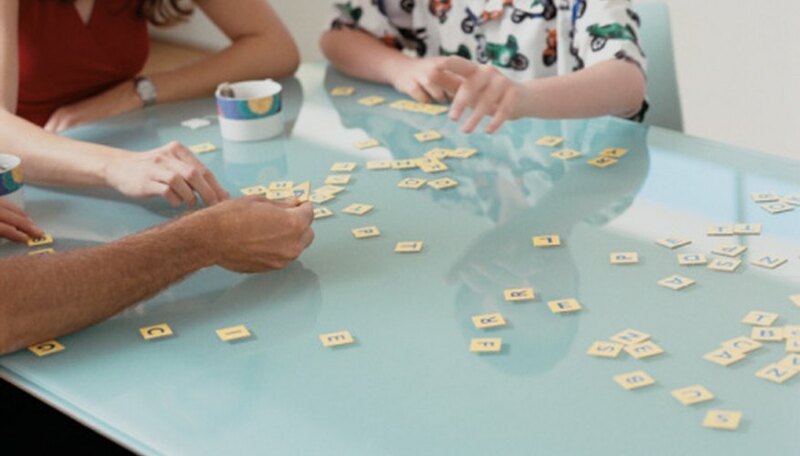 Upwords is a Scrabble-like three-dimensional board game designed for two to four players, aged 8 and up. This word game comes with a plastic gameboard, 100 plastic letter tiles, four plastic tile racks and a label sheet. Players use the stacking tiles to spell out words by playing letters across or down, similar to a crossword puzzle. But in Upwords, players can also stack letters on top of other letters to create new words. Upwords is a vocabulary-building game that is simple to play and that is fun for the whole family. Create a draw pile. Turn all of the tiles face down and mix them up. Pass out a plastic tile rack to each player. Have a pencil and paper ready to keep score, and a dictionary ready to challenge any words that players suspect are misspelled or illegal. Form the first word. The first player's word must be at least two letters long and must cover one of the special game squares in the center of the board. Place one or more letter tiles on the Upwords game board on your turn. Form a new word by adding tiles that connect to a word already on the board, or that change a word already on the board into a different one. Letters must read across or down and must connect to a word already on the board. Add your points and announce them to the scorekeeper to be recorded. See the "Scoring Points" section for instructions on how to total your score. Draw letter tiles from the draw pile to replace the ones you just played. Take turns creating and changing words on the game board. Exchange one of your tiles for a new one on your turn if you wish; do not then play a word on this turn. You can also pass your turn if you have no words to play. Stack letters on top of other letters to form a new word. For example, if the word "good" is on the board, you could place an M over the G to change it to "mood". You cannot place more than one letter on the same stack in a single turn, and you cannot stack duplicate letters on top of each other. Letters can be stacked up to five tiles high. Build a new word and change an existing word on the same turn. For example, you have the word "wood" and "dear" on the board. You can place an L on top of the D in "wood," and stack a P on top of the R in "deer" to change them into the words "wool" and "deep"; you score points for both words. You must keep one of the old words uncovered when building new words; you cannot cover an entire word. Build plural words on your turn. Play letters to form a word that connects to a word already on the board to make it plural. For example, you have the word "cat" horizontally on the board. Build down to form the word "mess", which connects with "cat" and makes it plural; you score points for both words. You cannot, however, merely add an S to a word on the board to make it plural. Score two points per tile for any word formed in whose letters are only one tile high. For example, the word "door" contains four letters, and each letter is only one tile high. Score this word by multiplying the four tiles by two points, for a total of eight points. Score one point per letter tile for any word in which one or more letters are stacked on top of each other. Count each letter in the stacked word and every tile that is stacked up under the word. For example, the word "deer" contains four letters, and has a letter tile under the D — multiply the five tiles by one to get a total of five points. Score two bonus points if you use the Qu tile in a word whose letters are all only one tile high. Score an extra 20 points if you use all seven of your letter tiles in a single turn. Score all words that you form during each of your turns. If a stack of letters is used in more than one word, each word is scored. End the game when all the Upwords letters have been played, or when none of the players can create any more words with her tiles. Have each player total her final score. Subtract five points from the total score at the end of the game for each tile you have left unplayed. The player with the highest score wins the game. When building words, any letter in your word that is adjacent to another letter on the board must form a word. Illegal words cannot be used in Upwords: words that are always capitalized, words that require a hyphen, words that require an apostrophe, abbreviations and symbols, prefixes and suffixes that cannot stand alone, foreign words that do not appear in the dictionary.